A calendar field type providing functionality for recurrence. 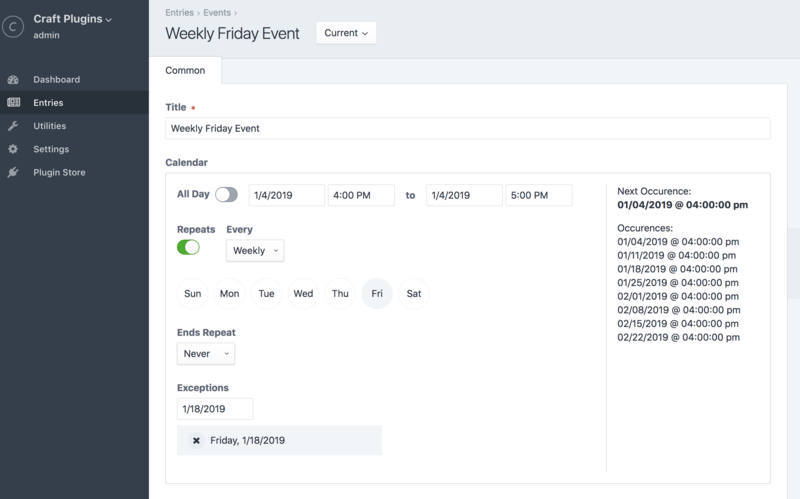 This plugin adds a calendarize field type that provides an interface to have repeating dates just like on a calendar interface. Repeat daily, weekly, and monthly with multiple other configurations per repeat type. Also comes with the ability add exception dates. This plugin requires Craft CMS 3.0.0-beta.23 or later and PHP7+. In the Control Panel, go to Settings → Plugins and click the “Install” button for Calendarize. There are two ways to use the calendarize field in your templates. When querying entries from craft you have the ability to access the calendarize field as you would with any other field. There is also a few added methods to help get all occurrences for repeating entries. These helpers will return an array of Occurrence models. Using the calendarize query variable will return all occurrences for all entries that match your criteria. This query returns an array of Occurrence models. You still have access to the parent element as you would with the craft query way. This queries entries with calendarize fields with upcoming occurrences. Can take any normal criteria, order (asc, desc) and a unique parameter. The unique param will limit occurrences to 1 per entry instead of listing all the occurrences. Returns array of entries. This queries entries with calendarize fields with occurrences after the provided date. Can take any normal criteria, order and a unique parameter. The unique param will limit occurrences to 1 per entry instead of listing all the occurrences.. Returns array of entries. This queries entries with calendarize fields with occurrences between the provided dates. Can take any normal criteria, order and a unique parameter. The unique param will limit occurrences to 1 per entry instead of listing all the occurrences.. Returns array of entries. This plugin leverages the use of the PHP RRule library. Docs for this can be found here PHP RRule. The rrule method returns the pre configured rrule with all its available methods. In addition, the getOccurrences method returns all occurrences of the entry with a limit of 10 by default and the getOccurrencesBetween returns the occurence between 2 dates. If the end date is null, it will not enforce the end date and give all occurence greater than the start date provided. Although the calendarize field can be used in a Matrix Block context, the occurence queries (upcoming, after, between) will not find those elements. Currently, we are just using the EntryQuery to populate occurrences. We are working on a way to allow for querying of Matrix data as well.